Create a modern look in any kitchen area with a beautiful custom glass splashback from Distinctive Glass. Perfect for the kitchen, bathroom or laundry, we have a range of colours to choose from and cater for all shapes and sizes. 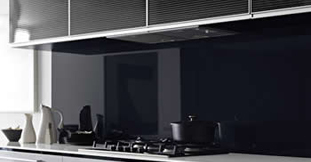 Splashbacks use 6mm toughened glass that can withstand everyday use. 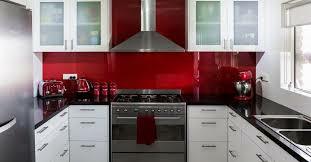 All our staff are qualified glaziers and have years of experience safely installing glass splashbacks. DecoSplash is a solid metal (2mm aluminium) splashback which is coated with a durable polyurethane powder coating. Catalogue or custom designs and images are then transferred directly into the polyurethane powder coating and the inks penetrate the full depth of the powder coating in a process known as sublimation.It allows you the creative freedom to be able to choose between a range of decorative finishes or your own custom image. You can also have the splashback made in a custom size to suit your application. 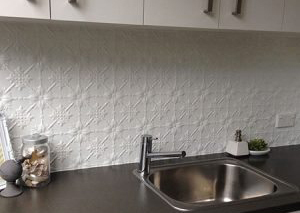 DecoSplash can be installed immediately after the cupboards are installed. The Art Deco is an elegant, simplistic square design that has evolved from the art deco era of the 1920's to become a contemporary favourite for all "modern" installs. . The Art Deco is suitable for a wide range of wall or ceiling installations and can be painted or powder coated in a myriad of colours. Suggested usage includes: feature walls, kitchen splash backs, bathroom tile alternatives, ceilings, counter fronts and many more. The panels are made from a specialised, mill grade aluminium that is approximately 0.55mm thick. All of our panels are treated with a non-chromate treatment which prepares the surface for subsequent priming and painting or powder coating.Painting or powder coating is recommended as without it panels are porous and surface scratches may be present as a result of the manufacturing process.